West Belfast Republican Youth Weekend - Bígí Linn! WEST BELFAST Ógra Shinn Féin are gearing up for the Republican Youth Weekend from 19 - 21 September. The action-packed weekend (which is open to everyone) will include public talks, political tours, a republican march, craic agus ceol and much more. A particular highlight of the weekend will be a talk on ‘Youth in Struggle’ by leading Belfast republicans Bobby Storey and Eibhlin Glenholmes on Friday, 19 September at 8pm in Seán Mac Diarmada’s GAA Club, Falls Road. It will look at the role that young people have played in the struggle through the Fianna, the IRA, in the jails and in Ógra today. 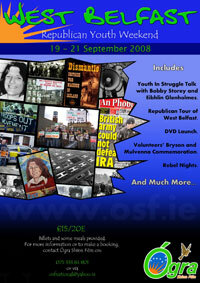 “The West Belfast Republican Youth Weekend is testament to the growing strength of Ógra in the city. We urge all interested youth from across Belfast and wider afield to come along and join in the debate and craic. “Throughout the weekend we will have an opportunity to remember our past, pay tribute to our fallen comrades, and discuss and debate the future direction of the struggle. Taille for Weekend: £15/€20 (which will cover billets and some meals).